With the flower show season well underway the next big one coming up is Hampton Court and as ever it’s looking interesting. 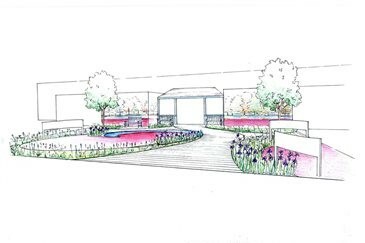 This year the show has been divided into three zones: Grow, Inspire and Escape, each zone containing gardens and exhibits in keeping with that theme. Grow is set to have the floral marquee, plant stalls and hands on gardening demonstrations. Escape will have the show gardens, “Growing Taste” cookery section, a rose “circus” as well as the trade stalls and advice stands. Inspire meanwhile will have the always popular conceptual gardens which this year take their inspiration from the seven deadly sins; guaranteed to have something for everyone. As far as gardens go, we have quite a few interesting offerings. Have you ever wondered where cranberries come from? Now thanks to the Ocean Spray “Get a Taste for New England” garden you can find out. Designed to show off the wet harvest of New England’s favourite fruit, this garden contains pools filled with cranberries, just as they would appear in their native wetlands. The spectacle of whole ponds of bright red fruit is likely to make this a vibrant and stand out feature, not to be missed. From a garden that’s hard to miss to one that you could walk right past without even knowing. The RHS “Invisible” Garden has been designed to show off all the interesting things happening in our gardens that we never even know about. Part garden, part educational feature, the Invisible Garden provides a look at the microscopic life teeming beneath the surface of our ponds, the eco chains of invertebrates milling through the flower beds and all manner of strange fungi creeping about under the soil. Interesting and intriguing, Hampton Court always has a few surprises in store each year and this year seems to be no exception.